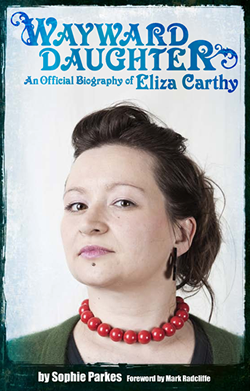 Wayward Daughter: An official biography of Eliza Carthy: What a night! A beautiful afternoon gave way to a sweltering night, as a sell out audience packed in to the Greystones Pub in Sheffield for the Wayward Daughter launch. First up, after an introduction from Phil Godsell, MD of Soundcheck Books, was the hilarious Bar-Steward Sons of Val Doonican, playing Barnsley-focused covers of songs we all knew only too well. After my most nervewracking moment - reading a short excerpt to the crowd as my knees knocked furiously and my fingers stuck to the pages - Eliza took to the stage with Jon Boden and Saul Rose. As always, Eliza was magnificent. The night culminated in the many stars of the Sheffield folk scene singing and playing in the middle of the room, audience members enthusiastically joining in. Folk Radio UK have done a short piece on the night, accompanied by photos and video from Elly Lucas. You can view it here.